The partnership provides an opportunity for psychiatrists and the mental health community to learn from spiritual leaders, to whom people often turn in times of mental distress. At the same time it provides an opportunity to improve understanding of the best science and evidence based treatment for psychiatric illnesses among faith leaders and those in the faith community. 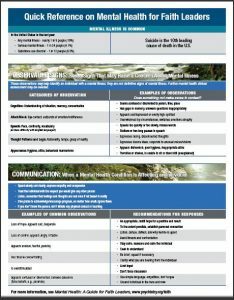 This guide provides information to help faith leaders work with members of their congregations and their families who are facing mental health challenges. 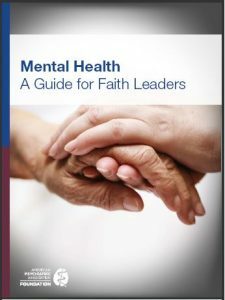 View the quick reference on Mental Health for Faith Leaders, a companion to the Guide. A Conception of the Interface Connecting Faith and Mental Health, Clark S. Aist, Ph.D. The Interface between Religion/Spirituality and Mental Health, John Peteet, M.D. A Call to Healing, Craig Rennebohm, M.Div. For more information, contact Amy Porfiri at aporfiri@psych.org.